I'm no good next to diamonds, when I'm too close they start to fade. For London-based rock band The Boxer Rebellion, the second time was a charm when it came to writing their new album, Promises. Two years ago, not long after the release of their 2011 disc The Cold Still, the band started penning new demos while at home in London that Winter, feeling their way back into the writing process. That early batch of ideas was thrown completely away, mostly because the musicians experienced a significant change in direction after they toured The Cold Still more extensively. “The experience of touring the last album was magnificent and very emotional,” singer and principle songwriter Nathan Nicholson said. “When we came off the road we went straight back to the studio to write – very much with the live show in mind. We wanted this album to fill the room with a different type of energy – still emotional and provocative, but at the same time uplifting, ambitious, positive, and far bigger than the sum of its parts.” In January of 2012, the band had made enough money through touring and record sales to secure their own writing and recording studio and that summer began laying down the initial versions of the songs on Promises. “It also meant we could write a lot more to drum loops or patterns that either Piers or Todd [Howe] conceived, rather than how we’ve written traditionally – with me bringing a song in written on an acoustic guitar and with the tempo set in stone from birth,” Nicholson adds. Throughout the rest of the year, the four musicians wrote and laid down demos lead by a constantly moving deadline, focusing on exploring and cultivating their newfound sensibility. They initially planned to use their own studio recordings as the final tracks but eventually felt like they needed someone to produce the album with. 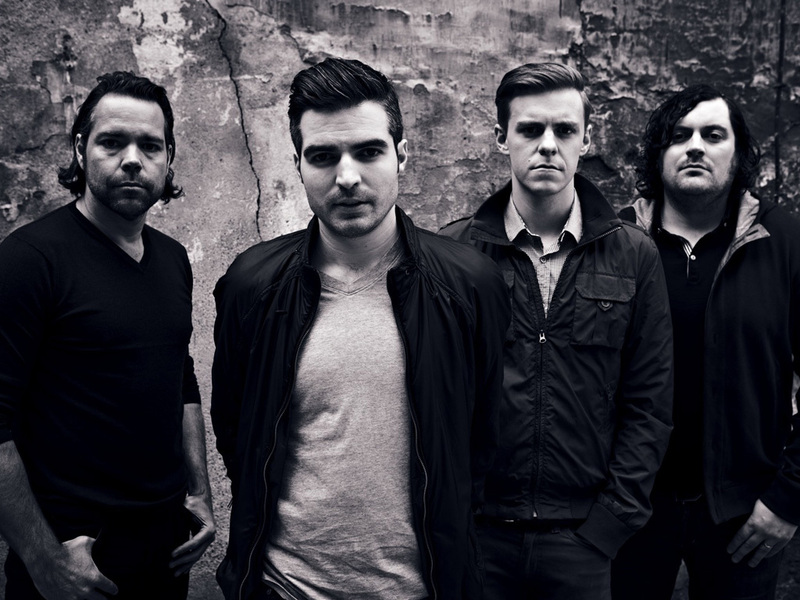 The resulting album, while still true to The Boxer Rebellion’s signature sound, pushes the boundaries set by the group’s previous three albums, drawing from the urgency of debut album Exits, the melodies and epic soundscapes of the Billboard chart-breaking Union, and the maturity of songwriting and musicianship displayed on The Cold Still. From the surging album opener, “Diamonds,” a lush, retro, indie rocker, to the electro-rooted “Fragile” and “Take Me Back,” the disc reveals a staggering array of musical layers. “You Belong To Me,” which Hewitt feels is one of the most relatable songs on the album, is a quietly emotive piano-led number, showcasing the band’s more introspective musical aesthetic, while tracks “Keep Moving” and “Always” deliver tremendously addictive melody and momentum throughout. Despite the record’s notable variety, a singular cohesion can be found in its complexity and emotional weight – it is, after all, music created by the same four guys – a fact the band reminds us of by closing the album with its namesake “Promises,” a thoroughly live and honest indie-rock spectacle. Promises, the band’s fourth album released on their own Absentee Recordings label, is another evolutionary step in The Boxer Rebellion’s ever-burgeoning career. After their first label (a subdivision of Mercury/Universal) imploded just after the release of 2005’s Exits, the foursome has continually overcome all odds, carving a path for themselves as a wholly-independent act with an ever-growing international fanbase. The band’s ability to push on and continue writing, recording, and touring has shaped their attitude, allowing them to be grateful for every achievement that’s come to pass in the years that have followed.